Spring break in San José, Costa Rica, wasn’t a vacation for the Foresters who participated in the week-long mission trip. Eight people went on the trip, including six Huntington University students and one faculty member and his daughter. From March 14 to the 22, the group crossed international borders and delved into a different culture. As part of the Christ For the City International service organization, they served, lived, shared, and now emphasize the significance of an international service experience. “I think that college students are at the perfect stage in their lives for the challenges that such international experiences bring as well as having something valuable to share,” said Dr. Todd Martin, associate professor of English at Huntington and leader of the trip. 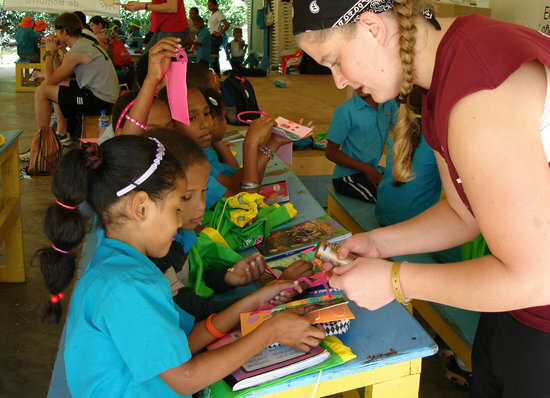 Alex Lute, a junior elementary education major from Lansing, Ill., was responsible for suggesting Costa Rica to the Joe Mertz Center as a mission trip possibility. He served with CFCI for six months in that same area of San José just after he graduated high school. Emily Simpson works with children on a picture frame craft. Simpson is a senior recreation management major from Star City, Ind. Dr. Norris Friesen, along with a group of 12 students, one faculty member and one staff member from Huntington University, witnessed extreme poverty first-hand during a spring break mission trip to the Dominican Republic on March 16-20. One windy day they found themselves walking afoot through a small housing project called Redemption Village. Glancing around, Friesen noticed a woman making charcoal to sell on the side of the street, and on the other side of the woman, a young boy was walking around completely naked. A single nomination for bishop, 2009-2013: Phil Whipple (right), senior pastor of Colwood UB church in Caro, Mich. The ballot for the Executive Leadership Team. An explanation of the Nominating Committee’s task and the process they followed in putting together the ballot. Phil Whipple is a graduate of Liberty University and of the Huntington University Graduate School. He took his first pastorate in 1984, but didn’t come into the United Brethren fold until 1990, when he became an associate at Richfield Road UB church in Flint, Mich. The next year, he began seven years as pastor of Pleasant Valley UB church (Lake Odessa, Mich.). Then, in 1998, he was assigned to Colwood. Under Phil’s leadership, the attendance has grown from 200 to over 500, and they have baptized 130 people. Phil and his wife, Sandy, have been married for almost 30 years, and have two sons, both of whom serve as Worship Arts pastors–Josh at Mongul UB church in Shippensburg, Pa., and Mike at Colwood. You can read online Phil’s vision statement, which includes six roles he sees for the bishop and four areas for immediate attention. The US National Conference Nominating Committee has nominated Philip Whipple for the office of bishop. The next bishop will serve 2009-2013. Phil is senior pastor of Colwood UB church in Caro, Mich. He is a graduate of Liberty University and of the Huntington University Graduate School. He took his first pastorate in 1984, but didn’t come into the United Brethren fold until 1990, when he became an associate at Richfield Road UB church in Flint, Mich.
Phil and his wife, Sandy, have been married for almost 30 years, and have two sons, both of whom serve as Worship Arts pastors–Josh at Mongul UB church in Shippensburg, Pa., and Mike at Colwood.You can read online Phil’s vision statement, which includes six roles he sees for the bishop and four areas for immediate attention. Phil’s name will be the only name on the ballot, though nominations can also be made from the floor of the US National Conference. Rev. J. Michael Caley, chairman of the Nominating Committee, explains the process they used. I was named chairman. We held our initial meeting January 15-16 in Canton, Ohio. Prior to these meetings, we received input from Bishop Ron Ramsey and Pat Jones, Director of Healthy Church Ministries. In addition, we gathered information from various regions and clusters. Realizing that this was a God-sized task, we sought divine direction asking for clear consensus. During the past four years, Bishop Ramsey’s leadership in growing healthy Great Commission churches has been positive. We clearly heard throughout the denomination the need for continuity. Understandably, a new bishop will bring his own leadership vision and administrative style to the task of growing healthy Great Commission churches. The Nominating Committee received lists of all ordained United Brethren ministers eligible to serve as bishop, whether currently assigned, unassigned, or retired. From that list we developed a slate of individuals who possess the leadership qualities sought in a bishop. We contacted seven individuals up through March 15, giving them the opportunity to pray and reflect upon their decision. Of the individuals we contacted, one felt a clear call of God’s leadership for the office of bishop at this time. We planned, and preferred, to offer a ballot with a least two names (additional nominations can be made from the National Conference floor). However, we also prayed that, as a Nominating Committee, we would have consensus concerning the ballot. In presenting the name of Rev. Phillip Whipple as a nominee for bishop of the Church of the United Brethren in Christ, USA, our prayer for consensus has been answered. 85 people attending the UB Historical Society Banquet. 33 signed up for the golf outing. 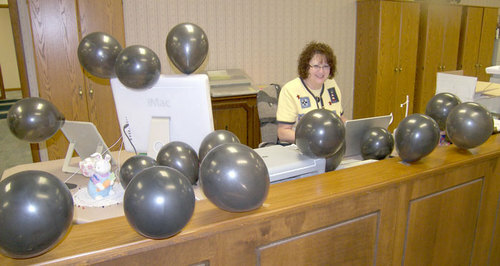 Jane Seely, our newest employee, yesterday celebrated a significant birthday ending in a 0, and thereby merited a desk adorned with numerous black balloons, not to mention a beautiful bouquet of flowers from her husband. And then there was the visit from her brother, Mike Caley, who made a surprise visit from Michigan. Mike is senior pastor of Banner of Christ UB church in Byron Center, Mich. He was in town for a meeting at Huntington University. We all gathered in the break room and sang “Happy Birthday” to Jane. 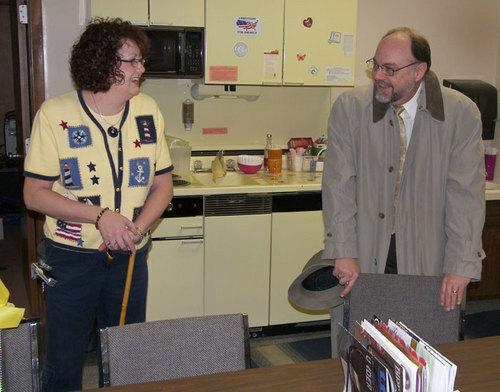 Then Mike, in a manner reminiscent of Tim Conway, doddered into the room wearing an old hat and overcoat. 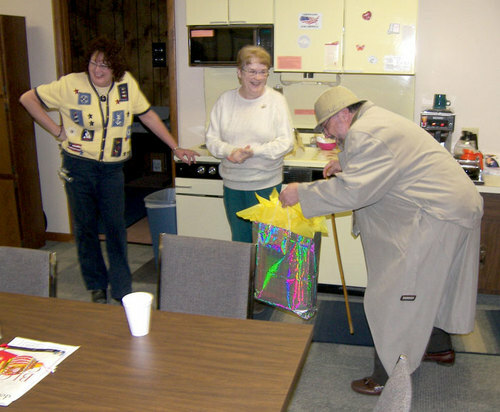 He was hunched over a wooden cane, carrying a package and muttering about being old, terribly old. Darlene Burkett came home from the hospital Saturday, March 21, having undergone extensive back surgery the previous Tuesday. She is expected to be out of the Global Ministries office for at least another three weeks. The number of registrations for the US National Conference continues rising, and seems to be above the number at this time in 2007 (when we ultimately ended up with over 900 people registered). Here are the latest figures. 80 registered for the UB Historical Society Banquet on Friday (Pat Jones will be speaking). 68 are children and teens. We keep the numbers updated on the US National Conference website. Everything regarding the National Conference will be posted there. 171 local church annual reports have been received by Bishop Ramsey (out of 193 churches). 143 churches have reported their referenda results. 151 churches have returned the national conference covenant. 138 churches have notified the bishop of their lay delegate selection(s). Dr. Owen Gordon (right), president of Jamaica Bible College, was elected vice president of the Caribbean Evangelical Theological Association. He’ll serve a two-year term. Owen Gordon, an ordained UB minister and pastor in Jamaica, is an endorsed missionary with Global Ministries.